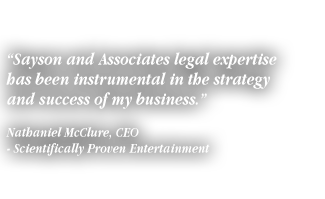 At the Law Offices of Sayson & Associates, our experienced attorneys are available to help you decide if this entertainment law firm is right for you. We are happy to announce that Joey Arnel Sayson has accepted an invitation to speak on Friday, February 11, 2011, at the Twenty-Eighth Annual International Law Symposium entitled "Entertainment & Sports Law: The International Dimension" sponsored by Whittier Law School's Center for International and Comparative Law. The title of his presentation is "Hollywood Studios To Start-Ups: Confessions Of A Consumer Products Licensing Attorney In International Licensing Or How I Helped That Cute Monkey And A Big Ogre Conquer The World." For more information, please contact us. We hope that you can join us. © 2019 Joey Arnel Sayson. All rights reserved. The information provided in this Sayson & Associates Quick Tips article is for general information purposes only and does not constitute legal advice. Do not act upon this information without first consulting an attorney. No Attorney-Client relationship is formed unless agreed to in writing. Copyright 2019 Law Offices of Sayson & Associates. All rights reserved. Thank you for visiting the Law Offices of Sayson & Associates web site. Please be advised that the material located on our site is for informational purposes only, is general in nature, and is not intended to and should not be relied upon or construed as a legal opinion or legal advice regarding any specific issue or factual circumstance. The entertainment law, intellectual property law and other legal information presented at this site should not be construed to be formal legal advice and shall not serve as the basis for the formation of an attorney-client relationship between you and this law firm. Therefore, if you want legal advice, please consult an attorney.